Get the most reliable online marketing ideas to promote your business online quickly. These 39 best Creative and Innovative online marketing ideas can increase your website traffic if executed properly. You will get more audience, leads, customers and clients. Use these ways to promote your business online internationally or even locally. You will learn in this article about Google Adwords, Social Media Marketing, online marketing through the blog, online marketing by forums, QA sites and online marketing using images, content distribution channels and various online marketing strategies. 1. Create a website for your business to promote your products and services online. A website is an online shop for your business. You can advertise, sell and use it for customer support. It’s really important in the modern world to connect with your customer worldwide by creating a website for your business, large or small. It means your business is accessible to users from any country by using any device which is a great advantage. You can create a business website on your own or you can hire website designer online and offline to get yourself a piece of internet real estate. If you decide to build the business website yourself, you can use WordPress.org, Wix, Tumblr, WordPress.com, Joomla, Drupal to create a responsive and faster website. You can also hire a professional website designer online or offline to create a website that helps to promote your business online. 2. Optimize your website for high value keywords that people are searching on Google. People search on Google when they need something. They need clothes, electronics, books, luxuries, online courses, learning materials, web designing services, customer support and much more. They buy online, they chat with customer support online, and they know that they can do everything on the Internet if they have the right keywords to search with. And for that, you have to optimize your website for the keywords. You can search keywords related to your products using Keyword Planner and then place those keywords in your website. Use those keywords optimally while you are explaining the benefits of your products and services on the website and social media networks. Be creative and improve the customer experience. Following are the tools help to optimize your business website for organic traffic. 3. Connect with your customers using a blog in your business Website. Business blogging is just like marketing your business by using your diary. You note down your experiences in the business world and then share it with the world on your business blog. Write a blog post for people searching on Google. Show visualized data and managed data that enable people to differentiate the advantages of using your products and services in the blog post. So your prospective customer can compare benefits they will get after buying and using your services. A blog is the method that will make people aware about how much you care about your customer and brand. Prove by action, that you’re not only doing business to earn money but at the same time providing great value in your products and services. 4. Publish more than 3 articles on your website every week. Customers and consumers want new, interesting and valuable experience each time they come online. Consistent blogging on the business website gets a higher rank on Google. It’s because you’re using various versions of same keywords in your blog post to reach more people looking for similar things. They connect with brands more than anything else, so this way, blogging is a method in which you remain updated with the brand experiences of the users. When you share your business or promotional post on social media you get free traffic to your website. Also the more you update your website with new and fresh material about your services the more traffic you get from search engines. 5. Find directory submission websites and list your business on free or paid promo sites. There are more than hundreds of directory and listing website on the Internet for every city and country. You can make a list of 40+ directory site in excel sheet and then list your business on those all sites. This way you can have up to 25 live ads on the free listing and if you get good results from listed content, you can buy silver, gold or premium packages to promote your business online using directory websites. 6. Upload products images on Pinterest Board. Create 10 or 100+ images of products and services creatively and then upload those images to the Pinterest board. People will also find and like your business by Google Images and Pinterest Boards. Use keywords in your images when describing the image content. This is a creative method to promote your business online. You can use Adobe Photoshop, Adobe Illustrator and Corel draw etc. to create, edit and manipulate images for online marketing. But you if you want to create images online, then you can use picmonkey, canva, befunky, pixteller and Infogr.am etc. 7. Tweet daily about products and services. Day to day marketing is like food for your business and customers. They will sample fresh content every day and it’s up to you to serve them the best you have to offer. Daily marketing is important because your business is hungry each day for growth. This food is generated by Twitter tweeting about your products and services with different keywords and phrases daily. Also, do not forget to add hashtags. You will get something, like one new follower, 1 new website visitor etc. Never miss any chance or any channel to market your business on the internet. 8. Post and share your blog post daily on Facebook, Google+ and Twitter. After publishing a blog post on your business website, share a small part or a preview with free images or creative images on Facebook groups, Facebook pages, personal profile, Google+ profile and communities with the hashtag and also on Twitter, StumbleUpon, Reddit, Pinterest etc. Keep doing it. It’s free. You will notice how easy it is to build a community around your business. Within 3-4 months hard work, you will start getting leads and loyal customers. You can use social media management tools such as HootSuite, Mention, Buzzsumo, Buffer, and Tweetdeck etc. 9. Lead your business personally and use your own image while promoting business on the Internet. 10. Create interesting, unique and valuable Facebook pages and groups related to your products and services. This is another social media marketing strategy in which you can create separate social media pages for each of your business products. And you only have to share marketing content related to that product on related Facebook pages and groups. It will not only help you to target right people for the right product but it will provide you more customers in less time. This is possible because your marketing message is targeted at the right people. Without doing much, you will get valuable data of users who like your page such as their reactions, feedback and other behavioral details on certain products and services. Create more than 10+ pages and groups for each product and services separately on all social media website. Creating 10+ pages to promote your business on Google+ is easy but you have to share high-quality content on social media communities for it to be successful today. And for that, you can research on their existed likes, +1 post, and their profile description. After that create and share the content important for them, handcrafted perfectly for them. 11. Find and follow people on Twitter you think will be your future customers. If your targeted customers are CEO’s, Marketing Manager, Social Media People, writer, then follow those people. Share likes and re-tweet their tweets. Create some influence among people who are considered online influencers. It’s a method of marketing in which you can inform them that I am here with such services and I agree with your business principles. When you follow your targeted customer they get notification by email and they can see your profile image or logo and profile description. And this is another free method of online marketing. 12. Use Google Adwords and PPC ad campaign for quick sells. Google Adwords PPC and all other types of the PPC ads campaign are great methods to sell your products and services quickly for the people searching Google. For that, you have to research on long tail keywords and try to find out exact match of key phrases that you can use on Adwords Ad campaign and on landing pages. Learn more about PPC Introduction and Google Adwords. 13. Check website traffic and followers of blogger related to your industry and ask them to publish review posts about your business. There are thousands of blogs getting more than 1000+ users per day from search engines and social media. You can contact those people to write and publish review post about your business. For writing reviews and endorsement of your business on their business blog, they can ask you for money and other things. You can approach them to lend a helping hand, especially those bloggers using Google Adsense on their website. You can compare website traffic and statistics analytics on similarweb.com, kissmatics and clicky etc. and various other websites analytics applications. List your business on Google My business or Google Map. After that notify or request your existing customers to write feedback reviews about your business on Google My business. You can get your business name at the top of the search engine when people search for local services on Google. Also, use Yahoo and Bing local listing services. And add your business details so that people can find you easily in the city you’re doing business. Add photographs to your Google Maps page and respond to the customer reviews in a pleasant manner. 15. Ask and answer questions on public forums such as Quora using your company account or personal account. You can create Quora account with your name or with the company name. After that find question, people are asking related to your industry, services, and products. Answer them and add the website link at the end of the answer to learn more or buy a complete solution. If your answer is helpful they feel happy, if they are satisfied then it will create great chances that they will click on the link and visit your website. This is another method to promote your business online using your knowledge and products benefits. You can use Reddit, Quora, Stack Overflow etc. 16. Upload Tutorials, user guide, buying guide and benefits of your products on YouTube. Create tutorial related to your website and business. This can be a user guide in which you can explain how to buy products on your business website and how to write testimonials etc. The more how to guide you write the better it will be for people to understand how they can get advantages of using your website and from the business. And also add a link to your post or product pages in Video description. 17. Find Email on directory websites and social media networks or Buy email marketing software to promote your business by sending promotional email to users. You can find email ids on listing website and phone numbers on social media website. After that, you can use Email Marketing Software or create promotional emails manually. Then send minimum 1 promotional and useful guide to those email Ids in a week. Also, add the website or product link in the email. Be mindful not to overdo it or you risk getting negative reviews. You can use MailChimp for marketing automation, Campaign Monitor, mailrelay, email marketing platform etc. 18. Add subscription widgets in your websites and ask people to subscribe. It’s important that you have loyal customer or visitor to be successful in online and offline business. You can do it by retaining customers for more profit. And for that, you add subscription plugin on your website. After that, you can ask people to subscribe to get monthly or weekly newsletter. When they do it, you will get their email ID. This also means they are interested in your services and product. And they are satisfied whatever they learned or purchased on your website. Now you can send them similar guide or product once a month. If you get 1000+ subscriber in your business website, it’s easy for you to sell more and at less cost. You can use MemeberPress, RestrictContentPro and Google Feedburner subscription plugin in your WordPress website to retain visitor and customers. Some people do not subscribe even they are satisfied or not. Even a satisfied customer does not share your blog post or product and services within any one many times. In this case for this type of people, you can sell 5% part of your product or services in free. But for that 5%, they have to use their Email Id and whatever data you want to collect. After that create and use email marketing strategies to inspire them to buy 95% part of your products. If they are serious or if they really want a solution they will buy100%, but you have to do it. 20. Call or message about your products and services to those people who share, likes, +1 and tweets your articles, products, and ads on social media. You can call or send a message about your website and products, combining offline and online marketing methods. You can call those people who liked, shared and re-tweets your products and services. They liked it means they may be interested. So, try this method too. Do not miss any opportunities to market your business online. Integrate the power of online marketing in your business. 21. Use Google Analytics code in your website or blog and find keywords ranked well on search engine. Then write articles based on those keywords to get more traffic to your business website. Almost all people use Google Analytics code on their website. But not all are getting benefits from data they are getting. In this case, you can use Acquisition, search queries and find keywords you’re getting a higher rank on Google. Also, you will get the information and data about what people are searching on Google, before visiting your website. So, use that data and create more content around those keywords. 22. Ask popular motivational speaker, business leaders, or leaders of your industry to endorse and taste your product and services then share it with their followers and subscribers. Almost all the leaders are promoting their own and others products on the YouTube, blog and social media. They are doing it because they know about the quality or benefits of the product they are promoting. They are promoting it for free or a payment. But you can also contact and find such people online who have big fan followings. Ask them to taste or use your product for free. If they like it, please share it with other people, so that they will get the benefit too. For example, if you’re selling books, give a free copy of your book to the leader. And if leader/influencer likes it they share it with others. 23. Find and connect with targeted customers on LinkedIn. You can write a blog on social media, you can create group or pages with the people you want to be part of your business directly or indirectly. They can be your customers. Use your website link in LinkedIn profile. Post small parts of the article on LinkedIn and try to market your products and services at the same time in the article. You have to be creative to promote your business online. And LinkedIn is professional’s network and that is to market your business to the right customer. 24. Create responsive and mobile friendly website to rank higher on Google. Google search engine is enough to market your business online. Just create a responsive mobile friendly website. Make your website as fast as possible so that loading time remains around 3 seconds in mobile and computers. Faster and responsive websites have more chances to get more traffic from Google. But never forget about the product quality content and value in your marketing content. 25. Create advertisement in PowerPoint and upload slideshow on Slideshare. Create marketable slideshows about your business and upload it to Slideshare or slide sharing website. Add description and keywords. For example, if you want to give answers to your audiences then share it by making a presentation. 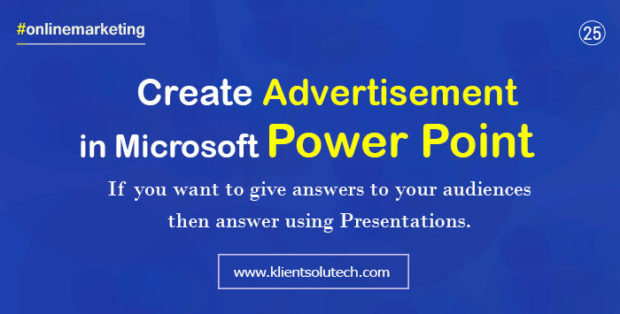 You can also create and distribute free power point presentation using your brand name. Look at on already existing material on Slideshare and generate new ideas. Slideshare is world’s popular content sharing communities. So take the advantages of everything that you’re getting for free or paid for promoting your business online. 26. Create and sponsor short animated movies and upload it on YouTube. Create short animated stories or movies that describe your product features or services coverage and upload it to your business channel. In this case, your business is sponsoring the story or animated movies. At the end, people come to know about something new and gain useful information. But they also learn or get responsive about who is producing such stories. And that’s a great method to promote your business using animated movies on the Internet. I am talking about The Aim – Motivational short film this kind of movies to promote your business online using movies or videos. 27. Add live chat plugin or real time chat option in your website and try to communicate with people visiting your website from Social Media or Google. 28. Create creative images with your brand name and upload it to social media or free images websites. Capture the best shots from your mobile camera and add your brand name then upload it on free images site or create your own website for free images with the brand name. You can provide free images for bloggers, social media marketers or for your targeted customers on your own website. In this case, you will get traffic from Google, Bing and Yahoo search engines with lower bounce rate. Here you can also notify users to provide back link or credits. 29. Create and use all social media and content distribution websites. Use all websites on the Internet in which you can participate in a discussion, you can comment, you can write and engage with other people. That content should be targeted to influence people. You can comment with your brand name, you can join online forums and discussion groups and in the same time, you can promote your business. You can use Scoop.it Content Curation, Medium – Read write and share stories etc. 30. Likes, Share the articles and social media content of your targeted customers. Like, Share the content of your targeted customer on social media. When you share other people’s content they will share your content. Try to keep it relevant to your interests and your targeted audience. Share for Share is a great way to co promote related businesses. 31. Record and market your podcast related to your products and services. Another popular method to promote your business online is to Record and distribute your podcast. You can record podcast related to your business. You can also create podcast related to any other interesting topics and sponsor those podcast with your business and brand message. 32. Create inspirational, social skill development, business development, education development and funny quotes and add your website URL or business name in the bottom of each image and share it daily on social media. You can create motivational, marketing quotes, business development, career development quotes to promote your business online. People are looking for quotes images for various things especially to share on social media. You can hire a writer, copywriter to write quotes around your business. After that, you can place your business name in the image at the bottom. Like this one. 33. Create Facebook, Google+, YouTube, Twitter profile cover page with your brand name. This social media marketing strategy in which you can create creative and top quality banners about your business. Then place those banners on your own Facebook profile, Facebook business page cover, twitter cover page, Google+ and YouTube etc. and update it frequently so more people get notified about business. 34. Use Tumblr and post images, share posts and link back to your business website. Tumblr is another website in which people are really interested to find new information and knowledge. So, you can create same page or blog with your business name. Share shorter content and link back to your website. Add business, quotes images and gif images and add your business name and contacts on those websites. 35. Use Google Adwords, Bing, Yahoo, and Facebook paid campaigns. Use all paid advertisement to promote your business online if your budget allows. In this, you need to find out which single paid marketing channel is best for you. To decide the best method you need to find out where your customers are more eager, creative and innovative. Do they need or desire? If your products and services are achieving desires of people then promote on paid social media channels. But if your products and services are solving the needs then use Google Adwords or PPC campaigns to promote your business online. 36. Tell your friends to share your brand images, business advertisement or business details on their own Facebook, Google+ profile. Many people use social media for knowledge and information. Not all are there for selling and marketing. In this case, your friends can become best social media marketer of your business. Just tell or request them to share your business page, website or images on their profile. You can also tell them that comment on my post, so it will attract more likes and shares. 37. Contact people in your city who have high traffic websites to place your banner ads on their website sidebar. There are people in your city who have websites, blogs, and social media pages getting huge traffic. These a called social influencers and they have a good online reputation among the public. It’s great if they are from different niche. Contact them to add your business advertisement on their website or share about my business on your social media pages. Create advertising banners like Google Adwords ads and send them to place it. It’s like banner exchange. 38. Try to contact authority website and publish a guest post. And try to get a backlink to your website. You need to write on other people’s websites to get faster results from online marketing. There are various benefits of Guest posting and one is that you will get backlinks. If you get backlinks from authority websites then your domain authority numbers grow. That increases your Google Rank. Another benefit is that you will get more customers or interest users to your business website. 39. Think of innovative new ways to connect with people. Creativity is the most important factor in online marketing. People like new and fresh content each time, just like we like our food. A little variety and creativity never hurt anyone. Provide them the immersive experience using your products and services they missed so far. So, that’ it friends, what I think and learned so far about online marketing and methods to promote any type of business online. Try to do some planning and implement each online marketing idea one by one and keep repeating the above process. Do not take online marketing lightly. It’s a creative business to promote other businesses and it takes a while to get it right. Just do what is possible for you right now to promote your business online. You don’t need to be perfect. But create and provide top quality products and services. And you never have to worry, about your next client. But that does not mean you can stop online marketing and stop innovating your marketing strategies. Never Stop Helping People – Never Stop Marketing.